Added on September 21, 2017 by sabine kussmaul. 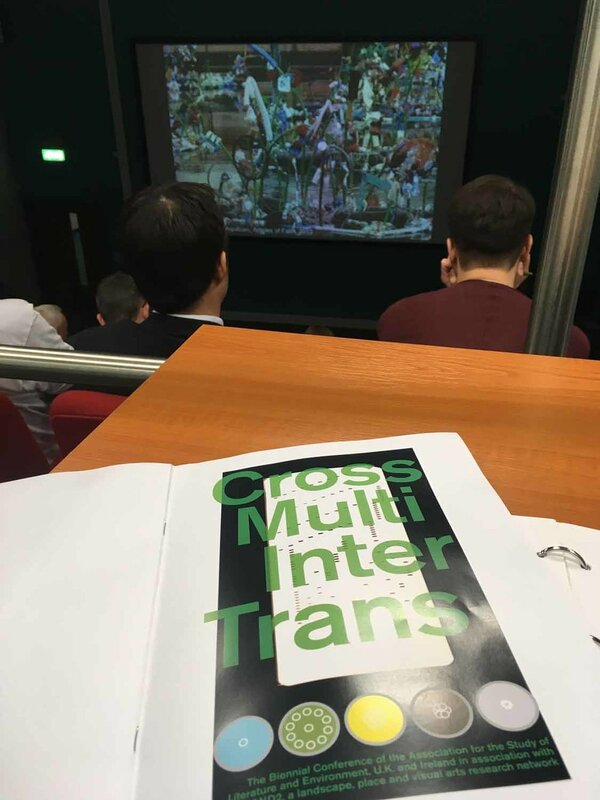 I went to watch presentations at 'Cross, Multi, Inter, Trans', The Biennial Conference of the Association for the Study of Literature and Environment. I could only stay for one day. This certainly widened my views about landscape, space, being outside, writing about nature, about borders. What amazing projects people engage with! Two presentations seemed to have particular relevance to my work. Edwina Fitzpatrick reported about people's experiences of remote places. She had interviewed individuals who had been in remote areas of the Earth, amongst them some polar explorers and deep-sea biologists. Edwina has worked on the Grizedale Forest Archives in some other work of hers. Her PhD thesis has the theme of loss, becoming lost! Lucy Collins presented about borders, their meaning and in particular about the situation with the border between Northern Ireland and The Republic of Ireland. I was impressed in what way she described aspects to do with borders, their relevance to space and to our feelings. And: I definitively need to look into the writing of Timothy Morton ....and read Marina Abramovic' biography.